Unlike most Sikh Americans my age, I never spent my summers at Sikh camps as a kid or attended Sikh youth conferences when I got older. As a third-generation Sikh American (my family has lived on the same plot of California farmland for nearly a hundred years), I had a very American name and couldn’t speak Punjabi well. So I grew up on the edges of the Sikh community. I always felt like an outsider – until I began the journey to make this film five years ago. 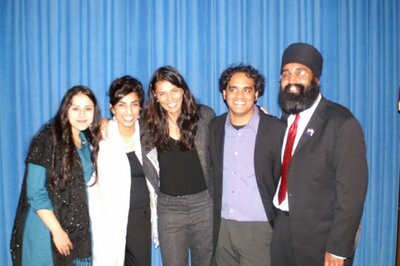 Through making Divided We Fall: Americans in the Aftermath, I found a way to use my outsider/insider perspective to raise the voices of Sikh Americans in the aftermath of 9/11 and fight for the expansion of who we ‘count’ as American. Now that the film is on national tour, I am discovering new ways to connect and understand my community. 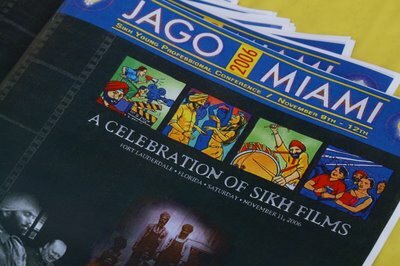 This weekend, I attended my first conference for young Sikh professionals – JAGO in Miami. 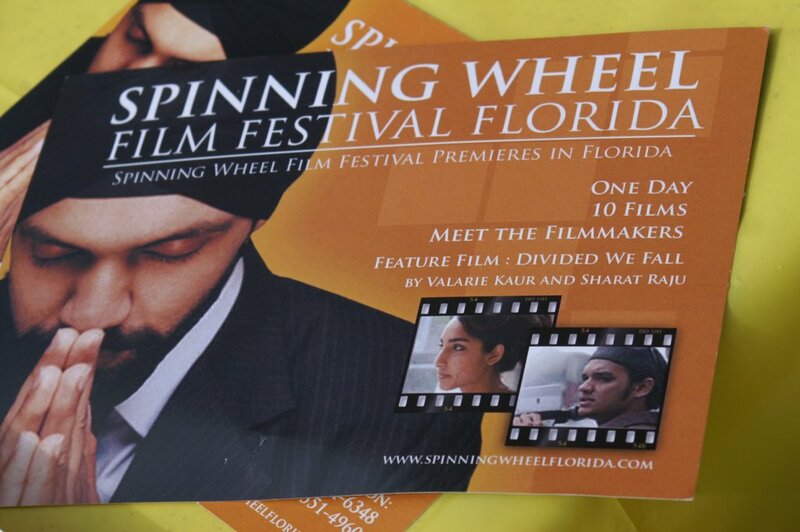 The film’s director Sharat Raju and I were invited to be part of the conference and screen Divided We Fall on the last day as the feature film in Florida’s first Spinning Wheel Film Festival. The three days of the conference were packed with speakers, small group discussions, prayer sessions, skits, and incredible meals. T. Sher Singh, the founder of the original Spinning Wheel Film Festival in Toronto (and thus the person responsible for first introducing Sharat and me back in 2003), gave the opening address. 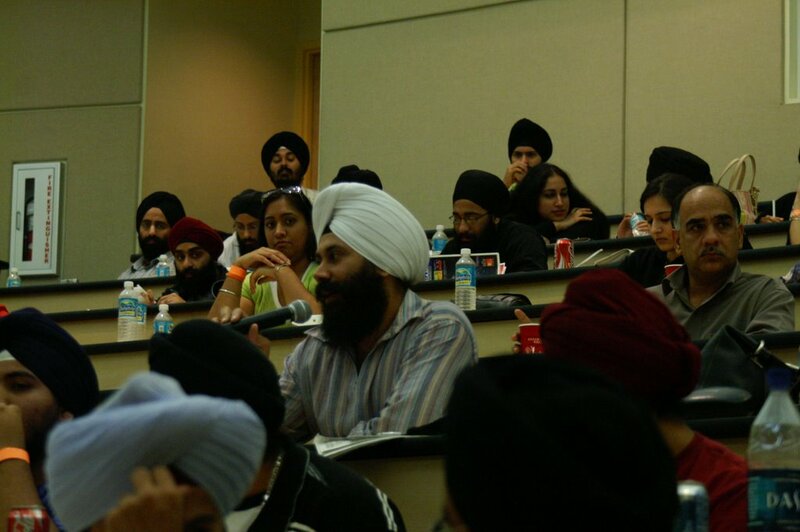 He spoke on the topic of Sikh identity. Sikh identity is a state of mind: the resolution to act as leaders. We have a legacy of leadership in Sikh tradition, whether in battle, on the streets, in the classroom, or at the roundtable. You are saint-soldiers – leaders in our world– above all. As someone positioned at the outskirts of our community, I was relieved that Sher did not decide to rehash the old debate on who ‘counts’ as Sikh and who does not. For a long time, the main discourse in Sikh gurdwaras (temples) and homes has centered on what constitutes ‘the good Sikh.’ Some say that only those who keep their long hair and turbans are ‘true’ Sikhs. Others say that wearing the five articles of faith is the only way to realize the ideal of the saint-soldier. Many say that one must read Gurmukhi (the script of the sacred book) in order to become the gurmukh (the Sikh ideal). Some condemn all use of English translations, not to mention the giving of English names to children – names like mine. I have always been baffled by this discourse: it encourages people to spend more time judging one another rather than deciding how to walk one’s own path. In my family, my grandfathers wear turbans, my father does not; my mother reads Gurmukhi fluently, my aunt does not; my cousins have Punjabi names, I do not. There is so much diversity in my family alone, I can’t help but think that any attempt to construct a single definition of a ‘good Sikh’ is impossible – and dangerous. I prefer the idea that there are many ways to be Sikh in the world, that we can embrace one another’s differences, and recognize that this diversity enriches our community. Even if we walk the path differently, we can still walk it together. I often speak about how Sikhs wish to be recognized as part of the American mosaic – but the Sikh community itself is its own mosaic. There is as much diversity within our own community as there is in our nation. 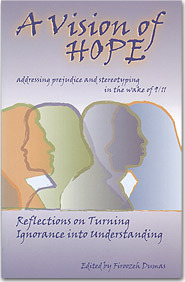 Resisting the impulse to judge others can free up our energy for solving real problems in our struggles responding to hate crimes, employment and educational discrimination, the ban on the turban and other religious articles in France, serious health risks such as diabetes and high blood pressure, and widespread domestic violence, and more. 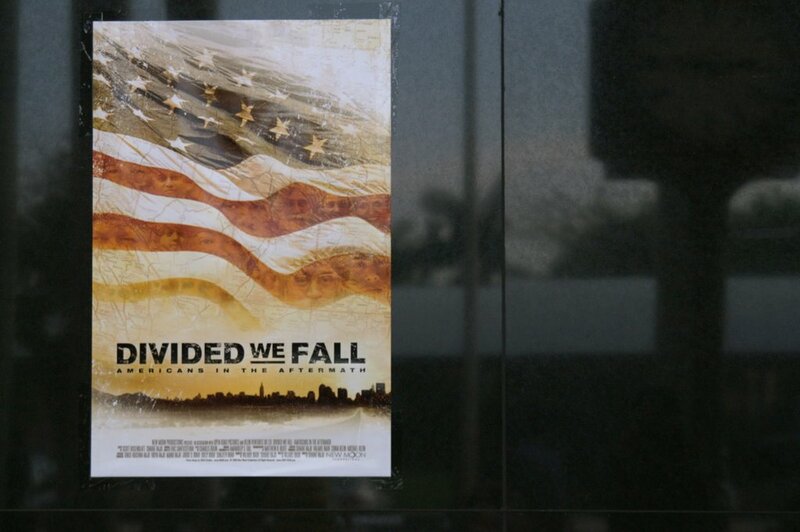 When Divided We Fall made its Florida premiere on the third day of the conference, it was the first time the film screened before an all-Sikh audience. In my Q&A, I shared these thoughts on the need to embrace our community’s diversity – and was surprised to hear applause after I made my remarks. The audience received my message warmly, many offered donations, others signed up to help spread the word. This incredible reception has given me the courage to continue speaking what I feel to be true – even at the risk of angering others or standing alone. I am grateful for the opportunity to make use of my position as a filmmaker, student, and third-generation Sikh woman to help expand the boundaries of discourse both in my community and country. Thank you to Sheena Kaur and all the organizers of Jago & Spinning Wheel 2006 for inviting us! Click here to find out where we're going next! One in three people would support a ban on Muslim women wearing veils which cover their faces in public places, according to a new survey. The ICM survey, carried out for the BBC, asked if people would approve the introduction by the Government of such a plan. Thirty-three per cent of respondents said they would approve the introduction of such a ban, while 56 per cent said they would not and just under one in 10 said they did not know. Asked if they would support prohibition in specific circumstances, 61 per cent said they would approve a ban in airports and at passport control, 53 per cent in courtrooms and 53 per cent in schools. Racist thug Charles Adams has been jailed for 15 months for telling a British Muslim woman on a packed train her children would grow up to be suicide bombers. Adams, 23, flashed his England tattoo at burkha clad train passenger Michelle Idrees from Luton before spitting in her face and calling her a ‘f****** Muslim slag’. She had just signed a book of remembrance for the victims of July 7. When she stood up for herself Adams’ 25-year-old brother Mark Edward Adams piled in with some more abuse. Greensboro store clerk is dead after thieves took his money and his life while his son watched. Shelly Lucas also recalled how generous Singh was: "If I didn't have the money, I could get gas or cigarettes and I'd come back and pay him later." Singh was known as a hard-working man, arriving at work at 7 a.m. and not leaving until 11 p.m.
Police are still trying to find the three men responsible for his death. Singh is survived by his three children and wife. A Sikh software executive visiting family in the Richmond area was denied entry Friday night to a popular Shockoe Slip restaurant because he refused to remove his turban. Hansdip Singh Bindra, 37, was shocked when management at Richbrau Brewing Co. told him he had to remove his "hat." "It was incredibly embarrassing. It's not a hat. When I wear a turban, it's a part of my body. It's a gift from God," said Bindra, who lives in Long Valley, N.J. "It's like asking a Jewish person to take off his yarmulke." Richbrau owner Mike Byrne said yesterday that the restaurant's policy forbids head coverings. "We have a policy where no bandanas or headgear is allowed, and we enforce it," he said. "I think the issue is he's quite clear on what our policy is. It's not a discrimination policy. It's simply no headgear." Bindra was out with his two male cousins who live in Chester and a male friend, all of whom are Sikh but do not wear turbans. A Muslim teaching assistant who refused to remove her veil in the classroom has been fired by the British primary school she worked for, the local authority said Friday. Many young Sikh men who have cut their hair say that they did so to escape the humiliation of turban searches at Western airports or to avoid being mistaken for Muslims. 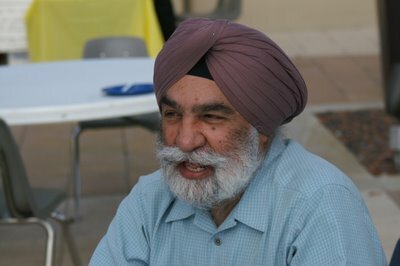 They cite Balbri Singh Sodi, a petrol station owner shot dead in Arizona on September 15, 2001. His American killer, bent on revenge for 9/11, thought that Mr Sodi’s turban indicated that he was an Arab. The Sikh community was shocked again this month when a gang of youths shouting racial abuse beat up a 15-year-old boy and cut off his hair in a public park in Edinburgh. But worrying as racist attacks are, Sikh elders are even more concerned by a broader official crackdown on overt expressions of religious identity in the West, especially in Europe. Phoenix-based airline US Airways has issued an official comment on the events of Monday at Minneapolis-St Paul International Airport, when six Muslim imams were removed from a flight bound for its home airport in Arizona. The airline said it was "diligently conducting its own investigation" into the incident, which saw the Islamic passengers placed in handcuffs and escorted from the aircraft before it left the tarmac of the Minnesota airport. Apparently on their way home to Phoenix after attending the North American Imams Federation conference in Bloomington, MN, the Muslim scholars had "aroused suspicion" among other passengers when praying in the terminal prior to boarding the aircraft. Bushra Khan, a spokeswoman for the Arizona chapter of the Council on American-Islamic Relations, told the Contra Costa Times: "All these men did was pray and it was misunderstood. "The bottom line is that they were Middle Eastern-looking men . . . and that scares some people," Khan added. For many Muslim and Arab-Americans these days, meeting a FBI agent can be an unsettling, even terrifying experience. Beginning almost immediately after the Sept. 11, 2001, attacks, the FBI began to root out suspected terrorists, and Arab and Muslim communities became the bureau's top targets. Agents rounded up hundreds of people for questioning. They raided Muslim charities, monitored mosques for radiation and held refugees for months because of security checks. To regain the trust of Muslim and Arab-Americans, the FBI has embarked on an aggressive national outreach program. The bureau's efforts, which include mosque visits and one-on-one meetings, have become so pervasive in certain cities that some young Muslim-Americans refer to the agency as the "Friendly Brotherhood of Islam." Police hunting race attackers who hacked off a young Sikh boy's hair have returned to the scene of the incident in a bid to trace witnesses. Lothian and Borders officers carried out the operation in the Leith area, a week to the day after the 15-year-old Asian boy was set upon by a gang of four white youths. Feel frustrated when a jangling bracelet or pocket full of coins sets off security screeners as you make your way into a government building? Consider the Sikhs, whose religion requires them to always wear a dagger. The centuries-old requirement has collided with beefed-up, post-Sept. 11 rules that no longer allow people to leave legal weapons and other banned items with security guards working in such buildings as courthouses and federal offices. In two dozen cases in the past two years, Sikhs have been arrested, threatened with arrest or harassed in disputes with guards over the ceremonial kirpan, according to the Sikh American Legal Defense and Education Fund. In an effort to bridge the culture-security gap, the Homeland Security Department and the Sikh legal group yesterday unveiled a poster meant to help screeners through these interactions. The poster, which will be distributed to federal facilities across the country, shows photos of different kirpans, ranging from a symbolic necklace some women wear to the more common three- to six-inch daggers, as well as full-on swords. Sikhs often wear them under their clothing, bound to them by a cloth body holster. MORE than 200 people from all over Britain attended a prayer vigil yesterday in support of a Sikh boy who had his hair cut off in a racial attack. Scores of Sikhs gathered with community leaders and representatives from other faiths in the Edinburgh park where the assault took place. Sikhs travelled from places such as London, Birmingham and Glasgow to the city's Pilrig Park, where a 15-year-old Asian boy was set upon by a gang of four white youths last Tuesday evening. He was subjected to a tirade of racial abuse before being kicked and punched to the ground. When the victim's bandanna came loose, the youths cut his hair off. Hair is a religious symbol for Sikhs, and it is strictly against their faith to have it shorn. The vigil was held to promote peace, respect and tolerance. HUNDREDS of Sikhs from across Britain are set to converge on Edinburgh tomorrow to hold a peaceful vigil following a racist attack on a city teenager. The 15-year-old Sikh victim of the racist attack was on his way to see relatives earlier this week when four white teenagers attacked him in Pilrig Park and cut his long hair with a knife. What The Hell Is Wrong With Glenn Beck? Glenn Beck at CNN interviewing the first Muslim congressman in American history says, "Prove to me that you are not working with our enemies." It's a pretty amazing thing to say (click on the link to see the video). The obvious question I would have for Glenn Beck, Prove to us that you are not working with our enemies. Never mind the impossibility of proving a negative. The enemies I'm talking about are ignorance, intolerance, racism. The enemies I'm talking about are the people that don't want us to have a diverse, pluralistic society. When I first watched this clip of CNN's Glenn Beck interviewing Keith Ellison, just elected to Congress who will be the country's first Muslim Congressman when he takes office, I thought I was watching one of Stephen Colbert's "Better Know a District" segments from his satirical "faux news" show. BECK: OK. No offense, and I know Muslims. I like Muslims. I've been to mosques. I really don't believe that Islam is a religion of evil. I -- you know, I think it's being hijacked, quite frankly. Unbelievable. Ellison, to his credit, handled it well. Who needs Fox News when you've got CNN's Headline News? 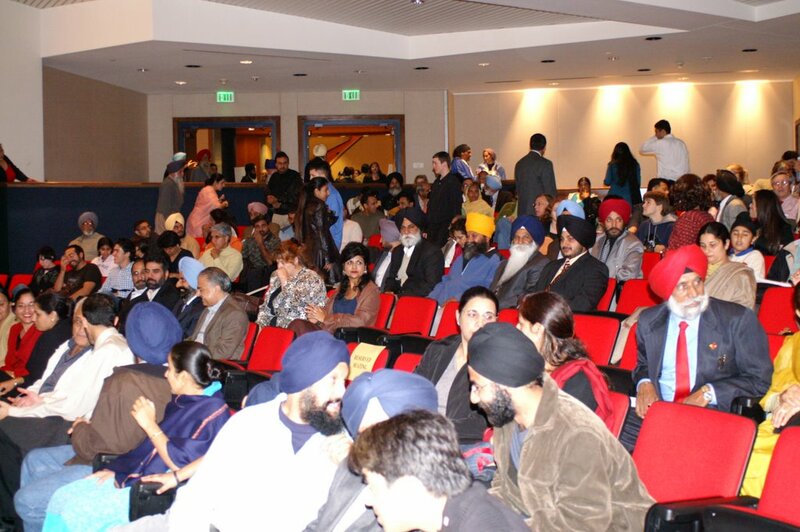 Hosted by the Sikh Student Association at George Washington University in honor of the first Sikh teacher Guru Nanak Ji , Divided We Fall makes its Washington, DC premiere five years after the September 11th attacks. 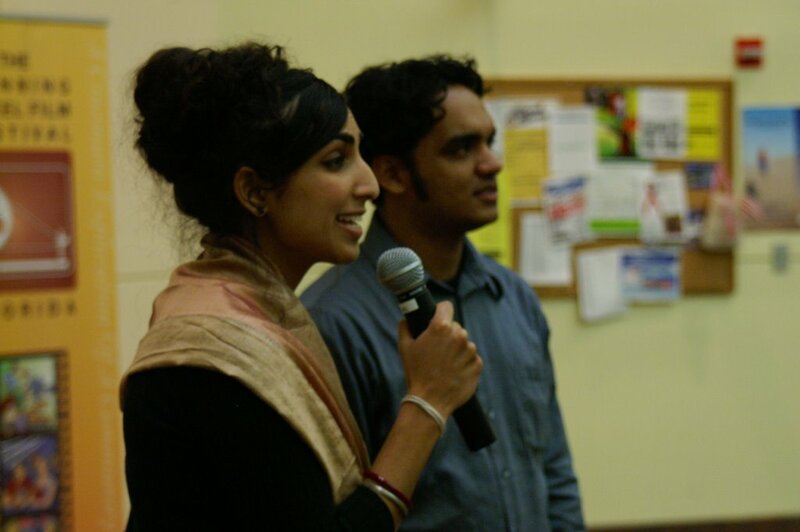 Dinner and Q&A with filmmakers Sharat Raju and Valarie Kaur follows the screening. Open to the public. Free admission. 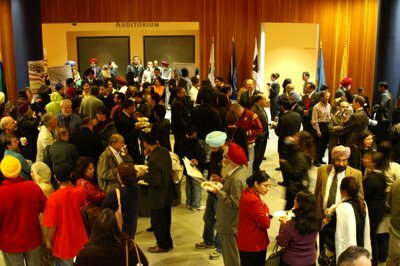 Co-sponsored by the Smithsonian Asian Pacific American Program. When a turbaned Sikh man is murdered in the aftermath of September 11, 2001, a college student journeys across America to discover who counts as "one of us" in a world divided into "us" and "them." Armed with only a camera, Valarie Kaur encounters hundreds of stories never before told – stories of fear and unspeakable loss, but also of resilience and hope – until she finally finds the heart of America, halfway around the world , in the words of a widow. Weaving expert analysis into a personal journey and cross-country road trip, the film confronts the forces dividing a nation. Efforts and initiatives to promote cross-cultural understanding are vital for survival, sustenance and success in the globalised world. Genuine understanding and respect for each other's beliefs and traditions can no longer be optional. 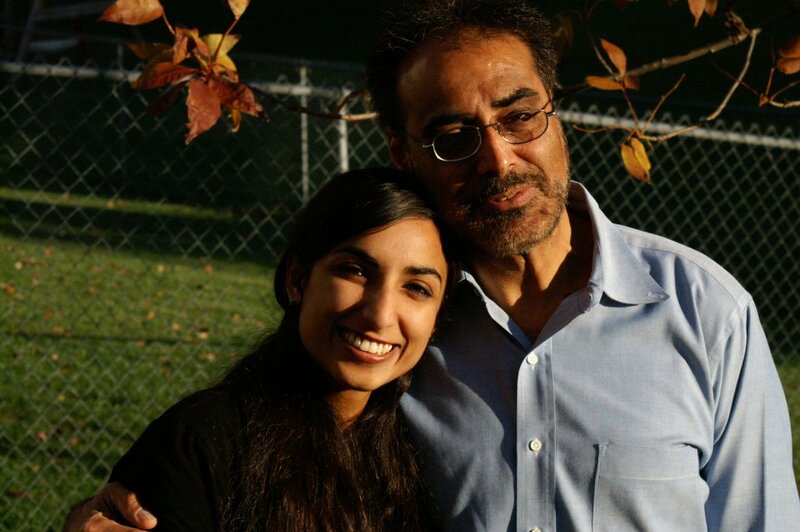 The murder of Alia Ansari in Fremont last month and other crimes of violence against Sikhs, Muslims, and other racial, ethnic, and religious groups since 9/11 in varied parts of US further reiterate that hate and bigotry are paths to perdition. In their response against such acts, people of Fremont observed a wear a hijab/turban day on Monday, November 13. Besides such similar responses, other long-term efforts for promotion of cross-cultural understanding are the global need of the day. For adequate representation of South Asia in Stanford, a new Center for South Asia (CSA) has been created at the university, co-directed by Professors Carl Bielefeldt and Linda Hess. 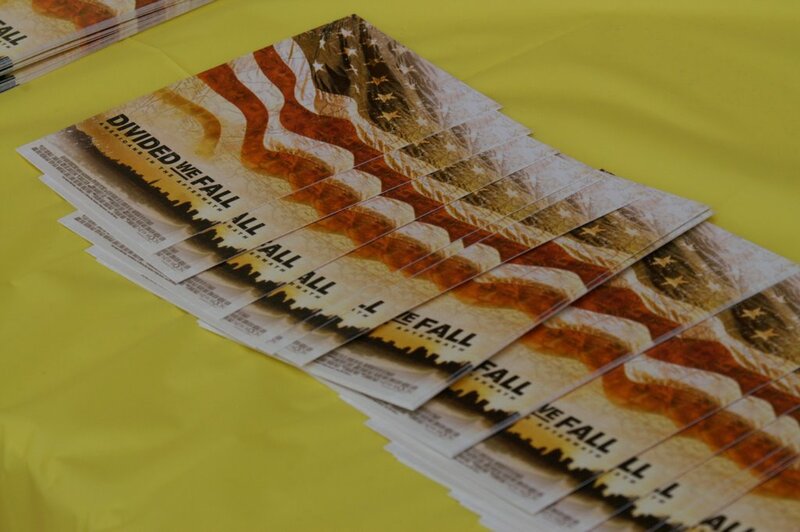 This year, the center is co-presenting two films in the San Francisco International South Asia Film Festival titled Divided We Fall: Americans in the Aftermath directed by Sharat Raju and Stanford's Valarie Kaur and The Forsaken Land directed by Vimukthi Jayasundara. In Divided We Fall, driven to action by the brutal murder of a man from her Sikh community in the aftermath of 9/11, Valarie Kaur sets out across America. Camera in her hand she crosses the country to discover who counts as "American" in a world divided into "us" and "them". Whether on the streets of a still-shocked Manhattan, the steps of the US capital, or in the desert towns of Arizona, Valarie captures the untold stories of 9/11. In cafes, restaurants, homes, places of business and street corners across the country, people invite her into their lives and share their remarkable struggles with violence, fear and loss. A SIKH teenager had his hair cut and was kicked and punched to the ground in a terrifying attack by racist yobs. The 15-year-old Edinburgh boy was on his way to see relatives when four white teenagers attacked him in Pilrig Park, near to Pilrig Park School. According to their religion Sikh men are not even allowed to trim their hair, but during the attack the thugs cut off the Asian youngster's long hair with a knife. The assault also caused his bandana, which the yobs may have been mistaken for a turban, to fall off. The boy was walking towards the Balfour Place entrance of the park when the gang began to shout racist abuse at him. He carried on walking but the youths set on him, punching and kicking him to the ground. The victim also suffered bruising and swelling to his nose and both cheeks, and soreness to his left shoulder and ribs. In the United States, the veil issue has also been addressed in courtrooms. One case took place in October in the midwestern city of Detroit, Michigan, which has one of the country's largest Muslim populations. Muslim businesswoman Ginnnah Muhammad went before a judge to contest a bill from a car rental company. The judge dismissed her case when she would not remove her veil. "When the judge asked me to take my veil off in court, I felt inhuman," she said. But Judge Paul Parah said he needed to see her face to judge her truthfulness. "I have to balance that. These are very delicate issues." In the southern state of Florida, several women were told they could not wear a veil for their driver's license photo. Khadija Athman, from Kenya, works on Muslim civil rights issues for The Council on American-Islamic Relations, or CAIR, a Muslim civil rights group. "I think in terms of drivers licenses and passport photographs it's reasonable to ask a person to have their face shown because it's a form of identification,” she said. “There is no other way you can identify this person as this is the person who is in this picture in the first place." Ibrahim Hooper, Communications Director for CAIR, says the Muslim holy book, the Quran, indicates women should dress modestly. He says many Islamic scholars say women should cover their heads. He also says they have the right to wear a veil. "The vast majority of Muslim scholars, both past and present, have determined that the requirements for a Muslim's women's attire is to cover everything except the face and the hands. We're against any restrictions on religious attire, or any time that the state would try to impose a particular form of dress." But some Muslim women, like author Asra Nomani, say the veil is a sign of oppression, making women faceless and powerless. She has written about her experiences being a Muslim woman in the U.S. and says she has been harassed by people at the mosque she attends for not wearing a headscarf. "To me, the veil is a very, very frightening expression of control of women." But Ginnnah Muhammad says, for her, wearing the veil is liberating. "This is my choice. I'm free. I'm happy." Ibrahim Hooper says what a Muslim woman wears should be her choice. "No one should be forced into any particular attire. But if somebody chooses not to wear what is commonly regarded as Islamic attire, that's their choice, and they shouldn't be attacked or abused because of that." Critics of U.S. detention policies warned yesterday that a brief legal document filed by the Justice Department this week raises the possibility that any of the millions of immigrants living in the United States could be subject to indefinite detention if they are accused of ties to terrorist groups. In the past, foreign nationals arrested in the United States have generally had the right to challenge their imprisonment for immigration violations or other alleged crimes in U.S. civilian courts. In the Marri case, the Justice Department essentially argues for an exception for those arrested as enemy combatants, legal experts said. We had first met Cruz Bustamante last October at the Spinning Wheel Film Festival in Los Angeles. There he had seen our film trailer and promised to do everything he could to get Divided We Fall to audiences. One year later, thanks to the skillful organization of Ravi Kahlon and Kiranjit Kaur in his office, he was hosting our California premiere. Once the theater doors opened, we flooded into the auditorium. There were rows of plush red seats and a stage with blue curtains that parted for the movie screen. More than 300 people filled the seats, stood in the back, and sat on the steps. The Lieutenant Governor took the stage to recognize the sponsors of the event and then give us a glowing introduction – he commended my courage for beginning the journey and Sharat Raju’s talent and vision as a filmmaker for finishing it. He also honored my parents - who were in the audience - for supporting our project, even when it took us into danger. It was the most incredible introduction Sharat and I have received on our film tour. He then presented both of us with a Resolution he had passed on the floor of the legislature - one that formally recognized the film and its message. I felt so deeply honored that for once I found myself speechless when the microphone was handed to me. I found the words to thank him. 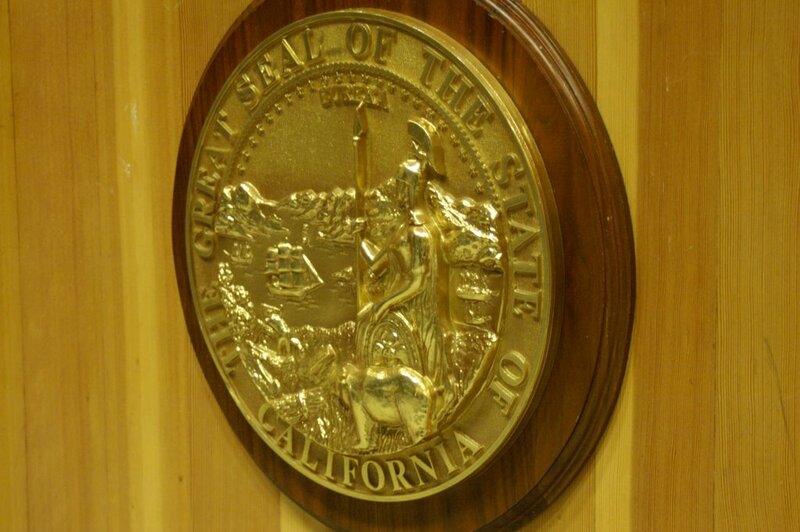 Resolved, that I, Cruz M. Bustamante, Lieutenant Governor of the State of California, do hereby recognize and applaud the important contributions that Ms. Valarie Kaur has made to our Golden State and the nation in her efforts to educate the public about the Sikh Community. It was a true honor for me to have the film recognized by the state of California, especially in a time when our stories are ripe for discussion in the mainstream American public. 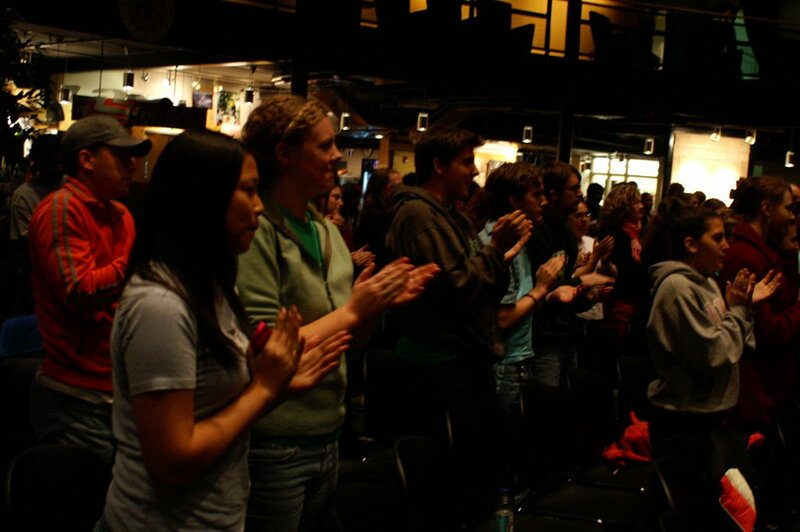 After the film screened, the audience rose in a sudden heartfelt standing ovation. We thanked those in the audience who had seen the film to completion: Gurprit S. Hansra, who speaks about his meeting with President Bush in the film and believed in this project in the very beginning at a time when I was receiving little support. Harpreet Singh, a leader in the El Sobrante community who has worked hard to secure protection measures for local Sikh cab drivers. Pargat Singh, a wise elder in the Sikh community who told me his compelling life story, including the loss of fellow cab drivers in hate murders. 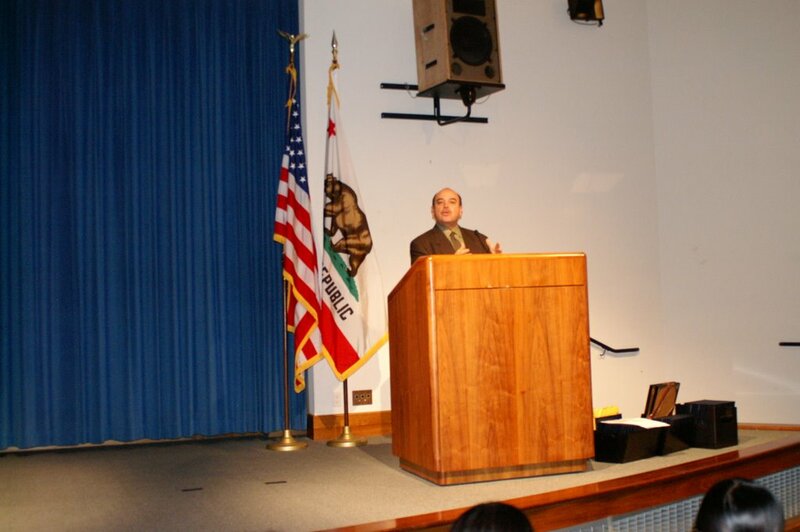 Basim Elkarra, the Sacramento director of the Council of American and Islamic Relations (CAIR) who helped me understand the problems facing local Muslims. The Q&A began with a question from a little girl in the front – how were you before you made the film, and how were you after? It was the most difficult question I had to answer, one that I’m still figuring out. Never had I imagined that the film would be recognized by officials and policymakers as vital to the discussion on diversity and respect in my home state. As the discussion continued, we heard voices from the Japanese American, Native American, Muslim and Sikh American communities, all drawing connections between one another’s struggles. Many people pointed to the ongoing violence - including the recent murder of an Afghan Muslim woman Alia Ansari in Fremont, whom many speculate was targeted for her veil. Thank you to Ravi Kahlon, Kiranjit Kaur at the Lieutenant Governor's office for their incredible hard work. Also to Satinder Singh for his support! (Pictured left to right: Kiranjit, me, Ravi, Sharat, and Satinder). Samantha Keller of San Jose wrapped a pink scarf around her face Monday, covering her long, curly brown hair. The church-going Catholic donned a Muslim veil as part of a global social experiment to show that she respects other people's cultures and faiths. She was among the few who took ``Wear a Hijab/Turban Day'' to heart. 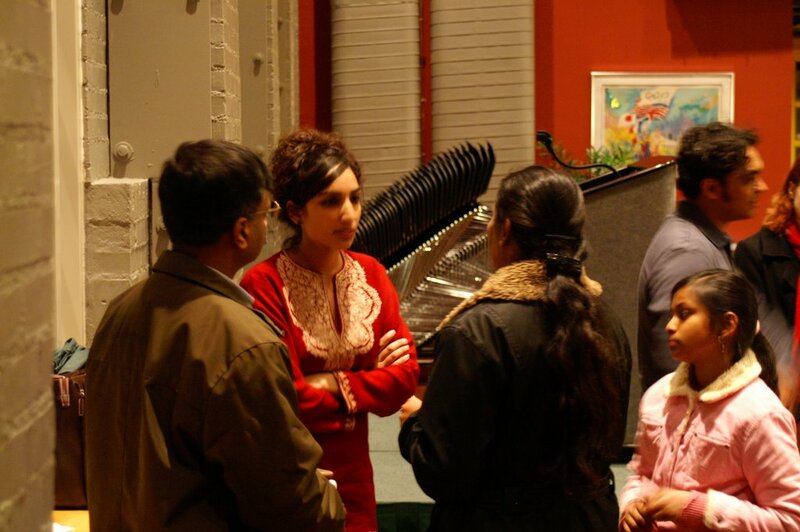 The event was dreamed up by a handful of Fremont community activists in response to the Oct. 19 slaying of Alia Ansari, 38, an Afghan mother of six who wore a hijab the day she was killed. Muslim women cover their hair to show modesty. Two young offenders were convicted of manslaughter Friday in the beating death of two elderly men, prompting distraught relatives to lash out at the justice system for throwing out a second-degree murder charge. The two young offenders were convicted on the lesser charge of manslaughter, in addition to aggravated assault and robbery in the 2005 beating deaths of Mewa Singh Bains and Shingara Singh Thandi. Justice William Grist said he could not convict the teens of the murder charge because there was no direct evidence that they intended to kill when they clubbed Bains, 82, and Thandi, 76, with a baseball bat in the washroom of Surrey's Bear Creek Park in July 2005. The teens, who as young offenders may not be named, attacked Bains on July 18, 2005, and robbed him of $150. He died later in hospital while undergoing surgery. Thandi was targeted the following day and struck three times in the head with a wooden baseball bat. He suffered a heart attack in hospital that Grist ruled was a direct result of the trauma. Distraught relatives of two slain Sikh seniors lashed out at the justice system Friday after two young offenders were convicted of manslaughter, aggravated assault and robbery, but acquitted of second-degree murder in the 2005 beating deaths of Mewa Singh Bains and Shingara Singh Thandi. Two teens were charged with the robbery of Bains, the aggravated assault of Bains and the second-degree murder of Thandi. B.C. Supreme Court Judge William Grist said he could not convict the teens, aged 13 and 15, of the murder charge because there was no direct evidence that they intended to kill Bains, 82, and Thandi, 76, when they clubbed them with a baseball bat in July 2005. Thandi, who was attacked July 19, died Aug. 6, while Bains, who was attacked July 18, died Sept. 3. Both assaults took place in in the public bathroom of a Surrey, B.C. park. The two teens, who cannot be identified, sat expressionless in a packed New Westminster, B.C., courtroom as Grist read his verdict. Outside court, tears streamed down the faces of family members as they said the youths will soon be out of jail. On Monday, some Bay Area women—no matter their religious beliefs—will add a new element to their morning routine: they will don the Muslim headscarf that may have motivated the murder of a Fremont mother last month. These women—and the men who cover their heads on Monday with a hat, yarmulke or turban—will wear headscarves to honor the Afghan-born woman and demonstrate solidarity with her community. The gathering will also honor the memory of Alia Ansari, 38, a Fremont resident shot in the middle of the day on Oct. 19 while walking down the street with her 3-year-old daughter. Ansari was on her way to pick up two other children at their elementary school and was wearing a hijab, the traditional headscarf worn by devout Muslim women. It was like coming home. Our San Francisco premiere at the Third I Film Festival was our first screening in California, and looking out into the packed audience in the city’s famous Roxie Theater, I was overwhelmed by the image of my parents, cousins, friends, professors, interviewees, and strangers standing up together to applaud our film at the end. It was our fifth standing ovation – and the tears couldn’t help but come. We had just flown through the night from Miami the night before to make our Sunday morning premiere in San Francisco. 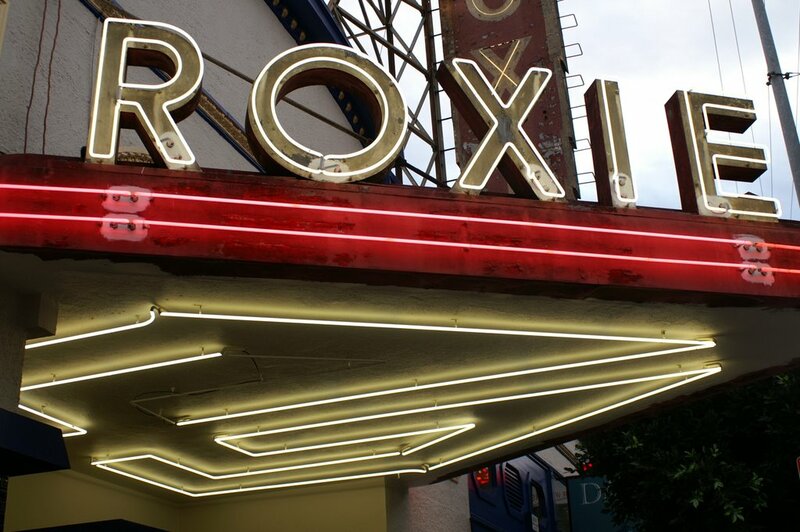 We were tired and barely made the screening on time, but we were energized the moment we stepped into the Roxie and took in the audience. 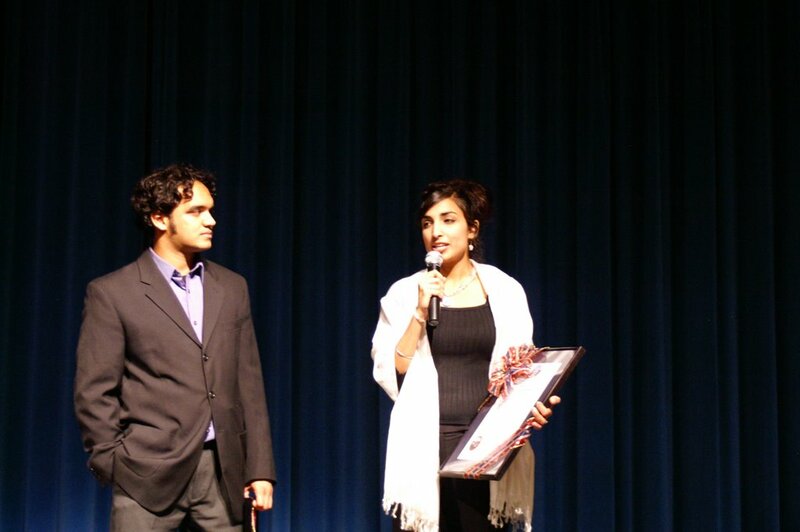 Kulwinder Dol, long-time friend and supporter, introduced us and the film began. It was one of our best screening to date – the image and sound quality of the film were superb, the audience was alive, and afterward we felt the outpouring of warmth. Then there was the long list of thank-yous. Sharat and I were able to recognize the handful of remarkable people in the audience without whose support, the film would not have been possible. We began with people in the film. Linda Hess, my Stanford advisor, now mentor and friend, whose words set me off “into the whirlwind.” Jayashri Srikantiah, Stanford law professor who provides some of the film’s best analysis. 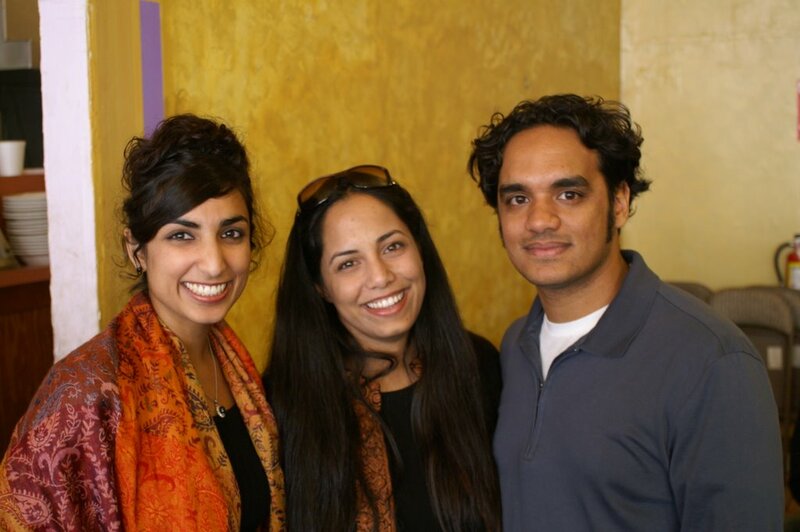 Nitasha Sawhney (pictured with Sharat and me), a Sikh lawyer interviewed in the film and our dear friend. And Mandeep Singh Dhillon, a Sikh lawyer who appears in the film leading a rally on the steps of the California state capitol. Then there were people who helped make the film. Andrew Chung, the first person who worked with me on editing the film, credited as production consultant, but who I’ve deemed as life manager. Karuna Tanahashi, a friend and artist in her own right who filmed Linda’s interview. 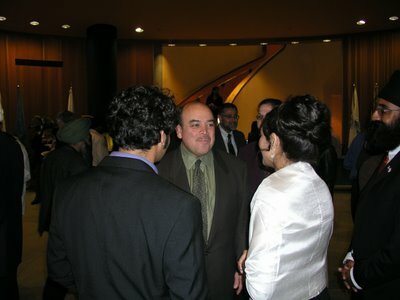 Sanjeev Brar, who filmed the last moving scene with the widow in India (he’s also my brother, pictured.) Kathy Jennings, production assistant and dear family friend. Sharon Gibson, the film’s story consultant. And finally my parents – Dolly and Judge Brar, who saw the film for the first time that morning. I continue to be astounded and deeply grateful for their unending support. 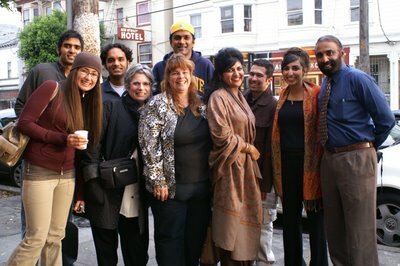 Pictured left to right: Sanjeev Brar (my brother), Sharmila Gill (my cousin), Sharat Raju (DWF director), Sharon Gibson (DWF story consultant), Kathy Jennings (DWF production assistant), Ravi (friend), Dolly Brar (my mother), John Tebbets (long-time friend), me and my father Judge Brar. 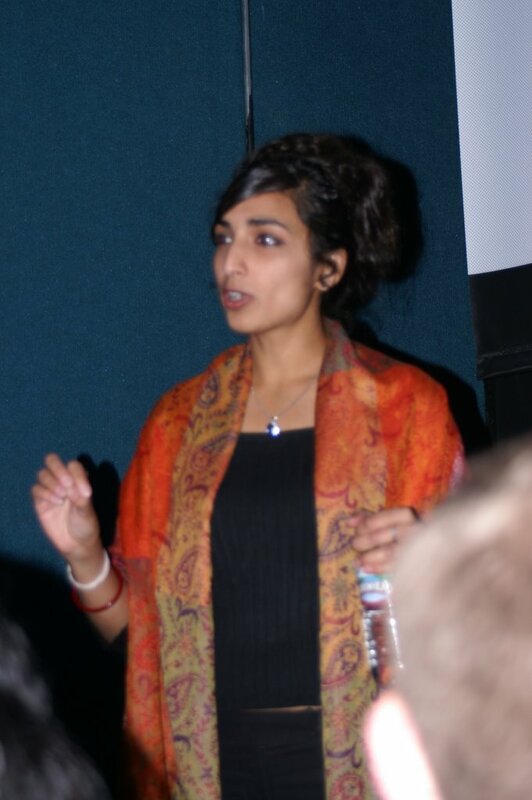 Thank you to Ivan Jaigirdar and all at San Francisco's Third I Film Festival for hosting an incredible screening! 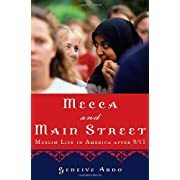 [Geneive] Abdo shows how 9/11 shook the world of American Muslims. Suddenly, they were seen by their neighbors -- and their government -- in the global context of Islamist terror. A combination of aggressive law enforcement, indiscriminate use of immigration laws and hyped-up prosecutions left Muslims in doubt about their place in society. Those who reacted by keeping their heads down (or veiled) to avoid attracting attention only exposed themselves to accusations of indifference to the tragedy -- or worse. This week, the whirlwind took us to Illinois on our first state-wide university tour: first to Illinois Wesleyan University, Bloomington (pictured), then to Southern Illinois University, Carbondale, and finally to the University of Illinois, Chicago. 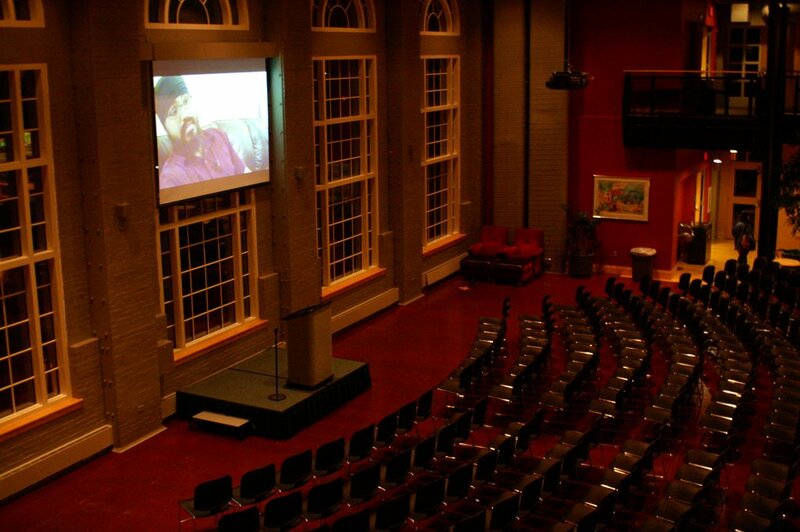 On Friday October 27, we arrived at Wesleyan University for the Illinois premiere of Divided We Fall. We were immediately embraced by Dr. Narendra Jaggi, the main force behind our university tour, and spent the day with the students responsible for bringing us to Wesleyan, led by Patrick Halloran (we're chatting about Sikhs Studies in the picture below) and Amee Patel of the South Asian Students Association (SASA). They gave us a tour of the campus – with only two thousand students at Wesleyan, the campus sustains a deep sense of community – and we were immediately embraced into it, thanks to SASA. We toured the campus together, visited classrooms, had lunch with professors, met with more students, ate dinner together, all before our premiere that night at the big brand-new student center. The premiere became one of the most powerful and overwhelming nights in the life of the film. We screened before more than 200 people from the college and local Bloomington community (many came after hearing director director Sharat Raju interviewed about the film on their local NPR earlier that day). 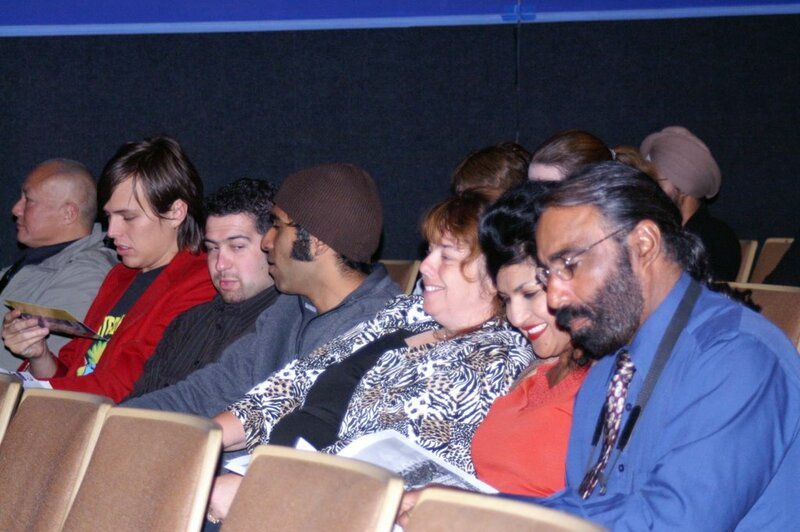 After introductions, the film began and Sharat and I watched the audience from the balcony above as they moved together in moments of laughter, wiped tears from their eyes during the painful parts, and applauded when the credits ended. It was the first time I “watched” the film entirely through the eyes of the audience. After Patrick introduced us to the stage, the entire audience rose together to applaud us with smiles and tears. And then the Q&A began. For nearly a half an hour, we held an open forum, with runners moving the mics through the audience as different people spoke from the heart, asked questions, shared reflections. Sharat and I told stories that weren't included in the film, stories that touched upon the central question that seemed to guide the entire discussion: what is solidarity. It was interesting that this audience – the first that seemed to capture the demographics of mainstream America – kept turning and re-turning to the question of what it means to stand in solidarity. They reflected on their own communities' experiences and the power to change the culture together – like a prairie fire. When people lined up to talk to us after the Q&A, they began hugging us one after another – strangers hugging strangers because we were no longer strangers. Each person felt compelled to embrace us and talk to us for a long time about how the film changed them: the third-generation Chinese American theater student who had been feeling lost for a long time now re-inspired to act, the African American museum curator who poignantly said "my braids are my turban," the Muslim woman who could not stop crying through the film, the Britisher whose grandfather was Indian but who had ignored the plight of his own family's encounters with discrimination until now, the 20 year-old African American student who knew nothing about Sikhs before but now felt compelled to stand up the next time he hears someone verbally abused on the bus, the couple who randomly came to the screening and had absolute faith that the film would get into theaters because "it moves everyone, of every background, no matter who you are." This film seems to tear open the hearts of people, helps us to bear the pain and bare the pain, the pain we share together, no matter who we are. It was a transformative night, a healing night, a night that we'll never forget. We talked to people for what felt like an hour, even signing autographs! my head dizzy from all the stories; it felt as though warmth and encouragement were poured into us, and we were full to the brim. We then spent a restful weekend at the home of Dr. Jaggi (pictured teaching Sharat life lessons) and his wife Hansa – where we treated to late mornings and South Indian breakfast and many beautiful stories. 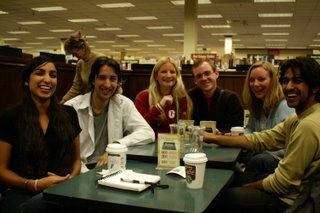 There were more students who wanted to speak with us, so we met at the local bookstore with a small group and talked about idealism, fatigue, and the possibilities for change – no professors, just college kids getting together to think critically about the world and our relation to it. (Pictured left to right, I'm next to Simon, Nichole, Will, Becky, and Nirjhar). We then continued south to our screening in Carbondale, this time joined by our excellent communications director Tracy Wells who drove from Omaha to tour with us. 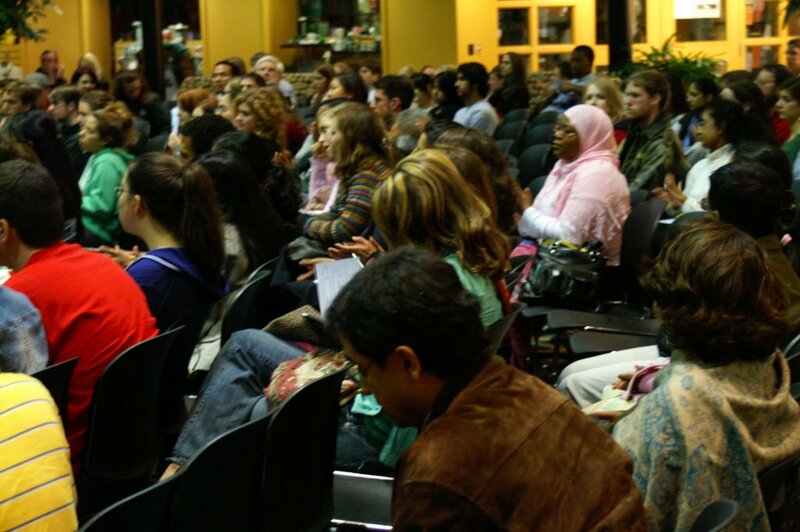 On Monday night, October 30, the film was hosted by the Department of Cinema and Photography at Southern University of Illinois, Carbondale. 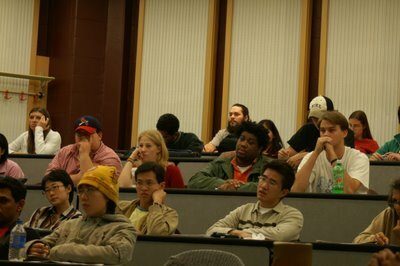 We screened before more than 80 film students who asked questions about both content and technical aspects after the screening. 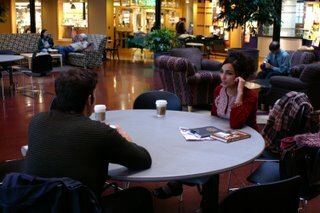 We continued the conversation over dinner with our beautiful and spirited host Jyotsna Kapur, professor of film studies. We spent the night at her very warm home before we made the seven-hour journey back north to Chicago for our final screening. On Tuesday night, October 31, we had a crowd of nearly 100 people who chose to spend Halloween night with us at our Chicago premiere. 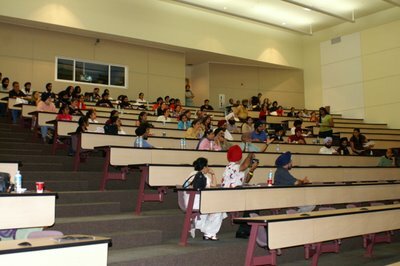 The screening was hosted by the Sikh Student Association at the University of Illinois, Chicago, thanks to the organization of Parminder Mann and Nitasha Kaur. 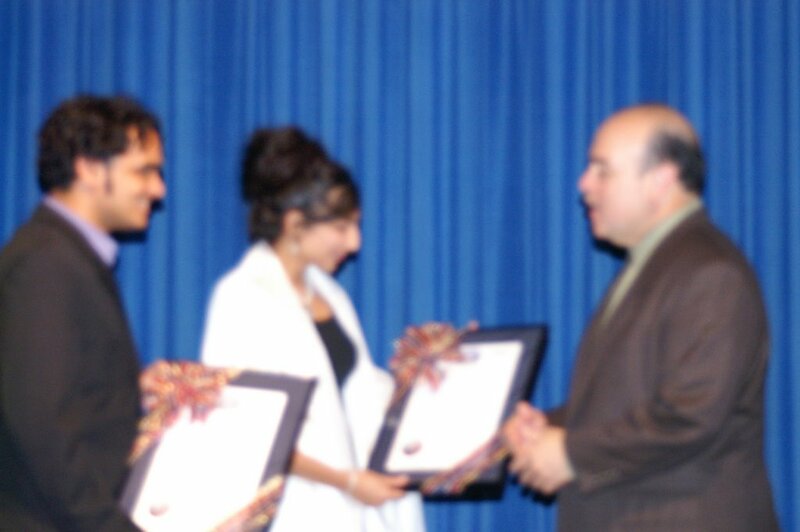 We had many friends in the audience – including our brilliant editor Scott Rosenblatt and researchers Steve Gulati and Harsimran Kaur Dang. We had another rich discussion afterward that of course continued in an Indian restaurant a few blocks away after the screening. The week was rich, exhausting, and exhilarating. We are resting before we head next to Miami in a few days. In the mean time, we are celebrating the new look of our website: http://www.dwf-film.com/ Until next time! Thank you again Dr. Jaggi for our whirlwind tour of Illinois! Police in Edmonton are investigating a hate crime that targeted a mosque in the city's north end last week. Scraps of pig meat were left at the doorstep and front windows of the Canadian Islamic Centre sometime after 1 a.m. on November 1, before members arrived for 5 a.m. prayers. The centre's president, Khalid Tarabain, called the incident a great concern for community members, who have seen windows broken and eggs thrown at the centre in the past. "Muslims don't eat pork, it's forbidden. It's a religious thing," he said. "It's not a vandalism or anything, it has a meaning." A senior judge has been asked to decide whether female Muslim advocates may wear the veil in court. The question was referred to Mr Justice Hodge, president of the Asylum and Immigration Tribunal, by an immigration judge at Hanley, Stoke-on-Trent, who had difficulty in hearing a veiled legal executive. Shabnam Mughal was dressed completely in black with a full-face veil leaving only her eyes visible. The judge, George Glossop, asked Miss Mughal on Monday if she would "kindly remove her veil to assist with communication". He told her: "It will allow me to see your face and I cannot hear you as well as I would like." After the Sept. 11 terrorist attacks, then Attorney General John Ashcroft ordered the FBI to detain anyone who may have been in contact with the men who were involved in hijacking three planes and crashing them in New York, Washington and Pennsylvania and killing more than 2,700 people. Agents arrested close to 5,000 Arab and Muslim men, about 800 of whom were charged with violations of U.S. immigration laws. Most of the men were eventually released or deported. However, five years after his arrest, Ali Partovi still sits in an Arizona detention center. The story of these men is told in “Persons of Interest,” a 2004 documentary by Alison Maclean and Tobias Perse that features interviews with the detainees and their families. A Pakistani man beaten on a Brooklyn street called for federal charges Monday against the five teens charged in the attack, speaking out for the first time since the attack two weeks ago. NY1's Shazia Khan filed the following report. "They were raising slogans, ‘Muslim terrorists,’” explained Shahid Amber, a victim of a hate crime. “[They] started cursing me, [saying] go back to your country, scum bags, you just messed this country up and all that." Amber recalled how it all began. He was eating ice cream in front of a Dunkin Donuts in Midwood, Brooklyn on October 29, when a group of teenagers started yelling ethnic slurs at him. 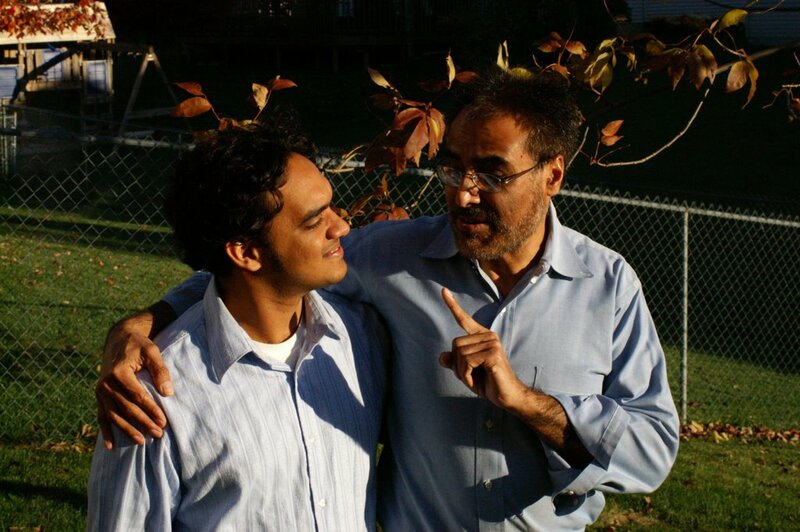 The 24-year-old immigrant from Pakistan said the verbal assault soon became physical. A Muslim police officer is taking legal action against the Metropolitan force following his removal from a top protection squad. Amjad Farooq, 39, was a member of Diplomatic Protection Group SO16, which guards dignitaries such as Tony Blair. PC Farooq had been working for the DPG for six weeks when he was told he had failed his security checks. His solicitor, Lawrence Davies, told the Independent: "Muslims are labelled guilty by association." David Huffman told police that it was just a prank gone wrong: On April 22, at a McDonald's in Tinley Park, he tapped a Muslim woman on the head, nearly pulling off her headscarf. But in a twist that surprised everybody, a Cook County judge ordered the teen to undergo sensitivity training at the Chicago office of the Council on American-Islamic Relations, the nation's largest Muslim civil rights organization. A prominent national Islamic civil rights and advocacy group today called on the Justice Department to bring federal charges against a number of teens who attacked a Muslim man in Brooklyn, N.Y., Sunday evening. The Washington-based Council on American-Islamic Relations (CAIR) said prosecutors are calling the attack a hate crime. The victim, who will require reconstructive facial surgery, said: "They were saying you Muslim terrorist...get out of the country." "The viciousness of this attack, coupled with the allegations of bias- motivated slurs should be sufficient to bring federal hate crime charges against the alleged attackers," said CAIR Legal Director Arsalan Iftikhar. Iftikhar said that CAIR yesterday called on religious and political leaders to repudiate the growing Islamophobia in American society that can lead to such attacks. Members of Fremont’s Muslim community packed into a forum style meeting last night to talk about last month’s fatal shooting of Alia Ansari. The community is still reeling from the shooting, which took place in broad daylight as Ansari walked with her 3-year-old daughter to pick up her children from school. The Council on Organized Islamic Relations, or CAIR, organized the meeting in response to the Oct. 19 slaying. KCBS’ Mark Seelig spoke with the organization’s spokeswoman, Shazia Jafri. "This is to provide the community with a platform for them to voice their concerns about the shooting that happened," she said. Fremont Police Chief Craig Steckler was asked to take part. Seelig reports that while he did his best to relay the message that Fremont is an extremely safe place to live, he grew tight lipped when asked about the progress of the Ansari case. "In a homicide case or any case, you get one try at the evidence. If you rush it you don't get another shot at it." Sikhs in Britain have called for the government to break down faith-hate crimes into different religious groups. Currently police are not required to monitor abuse or attacks by religion, but the Association of Chief Police Officers believes forces should do so. Sikhs say they are increasingly being subjected to abuse from people who mistake them for Muslims. The government says it has created new laws to combat faith-hate crimes which show such abuse is "intolerable". Mejindarpal Kaur, from United Sikhs, said her community's concerns needed to be taken more seriously. Prime Minister Stephen Harper's government is considering a special fund to help religious minorities protect their schools, places of worship and community centres from hate crimes or terrorist attacks, CanWest News Service has learned. The money would help groups train staff, construct new fences and install security cameras. "We are taking the request (for a fund for security help to vulnerable ethnic communities) under consideration," said a spokeswoman for Public Security Minister Stockwell Day in an e-mail Friday. The FBI is helping investigate a threat to destroy the Sikh temple on Tierra Buena Road, Sutter County Sheriff Jim Denney said Tuesday. A St. Peters man says he has no idea who spray painted racist graffiti on his garage Tuesday morning. When Maqbool Ali Khan lowered his garage door, he saw the graffiti scrawled on his garage door. He tried to wash it off, but the message it sent was indelible. Muslim organizations and human rights groups have accused the authorities of waging an anti-Muslim campaign in a presidential election year, while some terrorism experts say the government risks being too slow in removing security threats. “We need an emergency procedure to revoke badges, provided that the intelligence that calls the security of an employee into question is serious,” said Alain Marsaud, a lawmaker and former antiterrorism chief.